Transient receptor potential channels (TRP channels) are a group of ion channels located mostly on the plasma membrane of numerous animal cell types. There are about 30 TRP channels that share some structural similarity to each other. These are grouped into two broad groups: Group 1 includes TRPC ( “C” for canonical), TRPV (“V” for vanilloid), TRPM (“M” for melastatin), TRPN (“N” for no mechanoreceptor potential C) , and TRPA (“A” for ankyrin). In group 2, there are TRPP (“P” for polycystic) and TRPML (“ML” for mucolipin). Many of these channels mediate a variety of sensations such as pain, temperature, different kinds of tastes, pressure, and vision. In the body, some TRP channels are thought to behave like microscopic thermometers and used in animals to sense hot or cold. Some TRP channels are activated by molecules found in spices like garlic (allicin), chili pepper (capsaicin), wasabi (allyl isothiocyanate); others are activated by menthol, camphor, peppermint, and cooling agents; yet others are activated by molecules found in cannabis (i.e., THC, CBD and CBN) or stevia. Some act as sensors of osmotic pressure, volume, stretch, and vibration. These ion channels have a relatively non-selective permeability to cations, including sodium, calcium and magnesium. TRP channels were initially discovered in trp-mutant strain of the fruit fly Drosophila. Later, TRP channels were found in vertebrates where they are ubiquitously expressed in many cell types and tissues. Most TRP channels are composed of 6 membrane-spanning helices with intracellular N- and C-termini. Mammalian TRP channels are activated and regulated by a wide variety of stimuli and are expressed throughout the body. Sub-families of TRP ion channels in their respective groups. TRPC, C for “canonical”, is named for being the most closely related to TRP channels in drosophilia, sharing above 30% amino acid homology. There are actually only six TRPC channels expressed in humans because TRPC2 is found to be expressed solely in mice and is considered a pseudo-gene in humans; this is partly due to the role of TRPC2 in detecting pheromones, which mice have an increased ability compared to humans. Mutations in TRPC channels have been associated with respiratory diseases along with focal segmental glomerulosclerosis in the kidneys. All TRPC channels are activated either by phospholipase C (PLC) or diacyglycerol (DAG). TRPV, V for “vanilloid”, is named for the vanilloid chemicals that activate this channel, and are some of the most studied TRP channels. These channels have been made famous for their association with molecules such as capsaicin (a TRPV1 agonist), and its ability to produce heat sensation and act as a topical ointment for pain relief. TRPA, A for “ankyrin”, is named for the large amount of ankyrin repeats found near the N-terminus. TRPA is primarily found in afferent nociceptive nerve fibers and is associated with the amplification of pain signaling as well as cold pain hypersensitivity. These channels have been shown to be both mechanical receptors for pain and chemosensors activated by various chemical species, including isothiocyanates (pungent chemicals in substances such as mustard oil and wasabi), cannabinoids, general and local analgesics, and cinnamaldehyde. TRPM, M for “melastatin”, was found during a comparative genetic analysis between benign nevi and malignant nevi (melanoma). Mutatations within TRPM channels have been associated with hypomagnesemia with secondary hypocalcemia. TRPM channels have also become famous for their cold-sensing mechanisms, such is the case with TRPM8. TRPN, N for “no mechanoreceptor potential C” or “NOMPC”, are not found in mammals and have been shown only to be expressed in zebrafish, worms, and flies. There is more to be discovered as to what TRPN does, however, it is thought to be mechanically gated. TRPP, P for “polycistin”, is named for polycystic kidney disease that is associated with this channel. These channels are also referred to as PKD (polycistic kindey disease) ion channels. TRPML, ML for “mucolipin”, gets its name from the neurodevelopmental disorder mucolipidosis IV. Mucolipidosis IV was first discovered in 1974 by E.R. Berman who noticed abnormalities in the eyes of an infant. These abnormalities soon became associated with mutations to the MCOLN1 gene which encodes for the TRPML1 ion channel. TRPML is still not highly characterized. TRPY1, Y for “yeast”, is highly localized to the yeast vacuole, which is the functional equivalent of a lysosome in a mammalian cell, and acts as a mechanosensor for vacuolar osmotic pressure. Patch clamp techniques and hyperosmotic stimulation have illustrated that TRPY plays a role in intracellular calcium release. Phylogenetic analysis has shown that TRPY1 does not form a part with the other metazoan TRP groups one and two, and is suggested to have evolved after the divergence of metazoans and fungi. TRP channels are composed of 6 membrane-spanning helices (S1-S6) with intracellular N- and C-termini. Mammalian TRP channels are activated and regulated by a wide variety of stimuli including many post-transcriptional mechanisms like phosphorylation, G-protein receptor coupling, ligand-gating, and ubiquitination. The receptors are found in almost all cell types and are largely localized in cell and organelle membranes, modulating ion entry. Most TRP channels form homo- or heterotetramers when completely functional. The ion selectivity filter, pore, is formed by the complex combination of p-loops in the tetrameric protein, which are situated in the extracellular domain between the S5 and S6 transmembrane segments. As with most cation channels, TRP channels have negatively charged residues within the pore to attract the positively charged ions. Each channel in this group is structurally unique, which adds to the diversity of functions that TRP channels possess, however, there are some commonalities that distinguish this group from others. Starting from the intracellular N-terminus there are varying lengths of ankryin repeats (except in TRPM) that aid with membrane anchoring and other protein interactions. Shortly following S6 on the C-terminal end, there is a highly conserved TRP domain (except in TRPA) which is involved with gating modulation and channel mulitmerization. Other C-terminal modifications such as alpha-kinase domains in TRPM7 and M8 have been seen as well in this group. Group two most distinguishable trait is the long extracellular span between the S1 and S2 transmembrane segments. Members of group two are also lacking in ankryin repeats and a TRP domain. They have been shown, however, to have endoplasmic reticulum (ER) retention sequences towards on the C-terminal end illustrating possible interactions with the ER. TRP channels modulate ion entry driving forces and Ca2+ and Mg2+ transport machinery in the plasma membrane, where most of them are located. TRPs have important interactions with other proteins and often form signaling complexes, the exact pathways of which are unknown. TRP channels were initially discovered in the trp mutant strain of the fruit fly Drosophila  which displayed transient elevation of potential in response to light stimuli and were so named transient receptor potential channels. TRPML channels function as intracellular calcium release channels and thus serve an important role in organelle regulation. Importantly, many of these channels mediate a variety of sensations like the sensations of pain, temperature, different kinds of tastes, pressure, and vision. In the body, some TRP channels are thought to behave like microscopic thermometers and are used in animals to sense hot or cold. TRPs act as sensors of osmotic pressure, volume, stretch, and vibration. TRPs have been seen to have complex multidimensional roles in sensory signaling. Many TRPs function as intracellular calcium release channels. TRP ion channels convert energy into action potentials in somatosensory nociceptors. Thermo-TRP channels have a C-terminal domain that is responsible for thermosensation and have a specific interchangeable region that allows them to sense temperature stimuli that is tied to ligand regulatory processes. Although most TRP channels are modulated by changes in temperature, some have a crucial role in temperature sensation. There are at least 6 different Thermo-TRP channels and each plays a different role. For instance, TRPM8 relates to mechanisms of sensing cold, TRPV1 and TRPM3 contribute to heat and inflammation sensations, and TRPA1 facilitates many signaling pathways like sensory transduction, nociception, inflammation and oxidative stress. TRPM5 is involved in taste signaling of sweet, bitter and umami tastes by modulating the signal pathway in taste receptor cells. The TRP channels play a significant role in taste with channels responding to different tastes. TRPA1 responds to mustard oil (allyl isothiocyanate), wasabi, and cinnamon, TRPA1 and TRPV responds to garlic (allicin), TRPV1 responds to chilli pepper (capsaicin), TRPM8 is activated by menthol, camphor, peppermint, and cooling agents; TRPV2 is activated by molecules (THC, CBD and CBN) found in marijuana; TRPM5 is activated by the sweet glycosides found in the stevia plant. The trp-mutant fruit flies, which lack a functional copy of trp gene, are characterized by a transient response to light, unlike wild-type flies that demonstrate a sustained photoreceptor cell activity in response to light. A distantly related isoform of TRP channel, TRP-like channel (TRPL), was later identified in Drosophila photoreceptors, where it is expressed at approximately 10- to 20-fold lower levels than TRP protein. A mutant fly, trpl, was subsequently isolated. Apart from structural differences, the TRP and TRPL channels differ in cation permeability and pharmacological properties. TRP/TRPL channels are solely responsible for depolarization of insect photoreceptor plasma membrane in response to light. When these channels open, they allow sodium and calcium to enter the cell down the concentration gradient, which depolarizes the membrane. 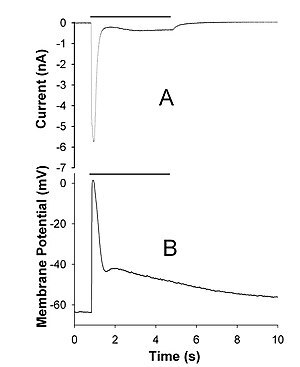 Variations in light intensity affect the total number of open TRP/TRPL channels, and, therefore, the degree of membrane depolarization. These graded voltage responses propagate to photoreceptor synapses with second-order retinal neurons and further to the brain. It is important to note that the mechanism of insect photoreception is dramatically different from that in mammals. Excitation of rhodopsin in mammalian photoreceptors leads to the hyperpolarization of the receptor membrane but not to depolarization as in the insect eye. In Drosophila and, it is presumed, other insects, a phospholipase C (PLC)-mediated signaling cascade links photoexcitation of rhodopsin to the opening of the TRP/TRPL channels. Although numerous activators of these channels such as phosphatidylinositol-4,5-bisphosphate (PIP2) and polyunsaturated fatty acids (PUFAs) were known for years, a key factor mediating chemical coupling between PLC and TRP/TRPL channels remained a mystery until recently. It was found that breakdown of a lipid product of PLC cascade, diacylglycerol (DAG), by the enzyme Diacylglycerol lipase, generates PUFAs that can activate TRP channels, thus initiating membrane depolarization in response to light. This mechanism of TRP channel activation may be well-preserved among other cell types where these channels perform various functions. Altered expression of TRP proteins often leads to tumorigenesis, as reported for TRPV1, TRPV6, TRPC1, TRPC6, TRPM4, TRPM5, and TRPM8. TRPV1 and TRPV2 have been implicated in breast cancer. TRPV1 expression in aggregates found at endoplasmic reticulum or Golgi apparatus and/or surrounding these structures in breast cancer patients confer worse survival. TRPV2 is a potential biomarker and therapeutic target in triple negative breast cancer. TRPM family of ion channels are particularly associated with prostate cancer where TRPM2 (and its long noncoding RNA TRPM2-AS), TRPM4, and TRPM8 are overexpressed in prostate cancer associated with more aggressive outcomes. TRPM3 has been shown to promote growth and autophagy in clear cell renal cell carcinoma, TRPM4 is overexpressed in diffuse large B-cell lymphoma associated with poorer survival, while TRPM5 has oncogenic properties in melanoma. In addition to TLR4 mediated pathways, certain members of the family of the transient receptor potential ion channels recognize LPS. LPS-mediated activation of TRPA1 was shown in mice and Drosophila melanogaster flies. At higher concentrations, LPS activates other members of the sensory TRP channel family as well, such as TRPV1, TRPM3 and to some extent TRPM8. LPS is recognized by TRPV4 on epithelial cells. TRPV4 activation by LPS was necessary and sufficient to induce nitric oxide production with a bactericidal effect. The original TRP-mutant in Drosophila was first described by Cosens and Manning in 1969 as “a mutant strain of D. melanogaster which, though behaving phototactically positive in a T-maze under low ambient light, is visually impaired and behaves as though blind”. It also showed an abnormal ERG response to light and it was investigated subsequently by Baruch Minke, a post-doc in the group of William Pak, and named TRP according to its behavior in the ERG. The identity of the mutated protein was unknown until it was cloned by Craig Montell, a post-doctoral researcher in Gerald Rubin’s research group, in 1989, who noted its predicted structural relationship to channels known at the time  and Roger Hardie and Baruch Minke who provided evidence in 1992 that it is an ion channel that opens in response to light stimulation. The TRPL channel was cloned and characterized in 1992 by the research group of Leonard Kelly. ^ Islam MS, ed. (January 2011). Transient Receptor Potential Channels. Advances in Experimental Medicine and Biology. 704. Berlin: Springer. p. 700. ISBN 978-94-007-0264-6. Vriens J, Nilius B, Voets T (September 2014). “Peripheral thermosensation in mammals”. Nature Reviews. Neuroscience. 15 (9): 573–89. doi:10.1038/nrn3784. PMID 25053448. ^ a b c d Kadowaki, Tatsuhiko (2015-04-01). “Evolutionary dynamics of metazoan TRP channels”. Pflügers Archiv: European Journal of Physiology. 467 (10): 2043–2053. doi:10.1007/s00424-015-1705-5. ISSN 0031-6768. PMID 25823501. ^ a b c d e f g Venkatachalam, Kartik; Montell, Craig (2007-06-07). “TRP Channels”. Annual Review of Biochemistry. 76 (1): 387–417. doi:10.1146/annurev.biochem.75.103004.142819. ISSN 0066-4154. PMC 4196875. PMID 17579562. ^ a b c d e f Szallasi, Arpad (2015-04-09). TRP channels as therapeutic targets : from basic science to clinical use. Szallasi, Arpad, 1958-, McAlexander, M. Allen. Amsterdam [Netherlands]. ISBN 9780124200791. OCLC 912315205. ^ a b c d e Moran, Magdalene M.; McAlexander, Michael Allen; Bíró, Tamás; Szallasi, Arpad (August 2011). “Transient receptor potential channels as therapeutic targets”. Nature Reviews Drug Discovery. 10 (8): 601–620. doi:10.1038/nrd3456. ISSN 1474-1776. PMID 21804597. ^ Berman, E.R. ; Livni, N.; Shapira, E.; Merin, S.; Levij, I.S. (April 1974). “Congenital corneal clouding with abnormal systemic storage bodies: A new variant of mucolipidosis”. The Journal of Pediatrics. 84 (4): 519–526. doi:10.1016/s0022-3476(74)80671-2. ISSN 0022-3476. ^ Dong, Xian-Ping; Wang, Xiang; Xu, Haoxing (April 2010). “TRP channels of intracellular membranes”. Journal of Neurochemistry. 113 (2): 313–328. doi:10.1111/j.1471-4159.2010.06626.x. ISSN 0022-3042. ^ 1940-, Hille, Bertil (2001). Ion channels of excitable membranes (3rd ed.). Sunderland, Mass. : Sinauer. ISBN 978-0878933211. OCLC 46858498. Winston KR, Lutz W (March 1988). “Linear accelerator as a neurosurgical tool for stereotactic radiosurgery”. Neurosurgery. 22 (3): 454–64. doi:10.1097/00006123-198803000-00002. PMID 3129667. ^ a b c Cosens DJ, Manning A (October 1969). “Abnormal electroretinogram from a Drosophila mutant”. Nature. 224 (5216): 285–7. doi:10.1038/224285a0. PMID 5344615. Montell C, Rubin GM (April 1989). “Molecular characterization of the Drosophila trp locus: a putative integral membrane protein required for phototransduction”. Neuron. 2 (4): 1313–23. doi:10.1016/0896-6273(89)90069-x. PMID 2516726. Eccles R (1989). “Nasal physiology and disease with reference to asthma”. Agents and Actions. Supplements. 28: 249–61. PMID 2683630. Brauchi S, Orta G, Salazar M, Rosenmann E, Latorre R (May 2006). “A hot-sensing cold receptor: C-terminal domain determines thermosensation in transient receptor potential channels”. The Journal of Neuroscience. 26 (18): 4835–40. doi:10.1523/JNEUROSCI.5080-05.2006. PMID 16672657. ^ Philippaert K, Pironet A, Mesuere M, Sones W, Vermeiren L, Kerselaers S, Pinto S, Segal A, Antoine N, Gysemans C, Laureys J, Lemaire K, Gilon P, Cuypers E, Tytgat J, Mathieu C, Schuit F, Rorsman P, Talavera K, Voets T, Vennekens R (March 2017). “Steviol glycosides enhance pancreatic beta-cell function and taste sensation by potentiation of TRPM5 channel activity”. Nature Communications. 8: 14733. doi:10.1038/ncomms14733. PMC 5380970. PMID 28361903. ^ Leung HT, Tseng-Crank J, Kim E, Mahapatra C, Shino S, Zhou Y, An L, Doerge RW, Pak WL (June 2008). “DAG lipase activity is necessary for TRP channel regulation in Drosophila photoreceptors”. Neuron. 58 (6): 884–96. doi:10.1016/j.neuron.2008.05.001. PMC 2459341. PMID 18579079. Levine JD, Alessandri-Haber N (August 2007). “TRP channels: targets for the relief of pain”. Biochimica et Biophysica Acta. 1772 (8): 989–1003. doi:10.1016/j.bbadis.2007.01.008. PMID 17321113. Prevarskaya N, Zhang L, Barritt G (August 2007). “TRP channels in cancer”. Biochimica et Biophysica Acta. 1772 (8): 937–46. doi:10.1016/j.bbadis.2007.05.006. PMID 17616360. ^ Prevarskaya N, Zhang L, Barritt G, et al. (2 June 2007). “TRP channels in cancer”. Biochimica et Biophysica Acta. 1772 (8): 937–46. doi:10.1016/j.bbadis.2007.05.006. PMID 17616360. ^ Lozano C, Córdova C, Marchant I, Zúñiga R, Ochova P, Ramírez-Barrantes R, González-Arriagada WA, Rodriguez B, et al. (15 October 2018). “Intracellular aggregated TRPV1 is associated with lower survival in breast cancer patients”. Breast Cancer (Dove Med Press). 10: 161–168. doi:10.2147/BCTT.S170208. PMID 30410392. ^ Elbaz M, Ahirwar D, Xiaoli Z, Zhou X, Lustberg M, Nasser MW, Shilo K, Ganju RK, et al. (27 May 2016). “TRPV2 is a novel biomarker and therapeutic target in triple negative breast cancer”. Oncotarget. 9 (71): 33459–33470. doi:10.18632/oncotarget.9663. PMID 30323891. ^ Wong KK, Banham AH, Yaacob NS, Nur Husna SM, et al. (2 February 2019). “The oncogenic roles of TRPM ion channels in cancer”. Journal of Cellular Physiology. Epub ahead of print. doi:10.1002/jcp.28168. PMID 30710353. ^ Hall DP, Cost NG, Hegde S, Kellner E, Mikhaylova O, Stratton Y, et al. (10 November 2014). “TRPM3 and miR-204 establish a regulatory circuit that controls oncogenic autophagy in clear cell renal cell carcinoma”. Cancer Cell. 26 (5): 738–53. doi:10.1016/j.ccell.2014.09.015. PMC 4269832. PMID 25517751. ^ Loo SK, Ch’ng ES, Md Salleh MS, Banham AH, Pedersen LM, Møller MB, Green TM, Wong KK, et al. (27 April 2017). “TRPM4 expression is associated with activated B cell subtype and poor survival in diffuse large B cell lymphoma”. Histopathology. 71 (1): 98–111. doi:10.1111/his.13204. PMID 28248435. ^ Palmer RK, Atwal K, Bakaj I, Carlucci-Derbyshire S, Buber MT, Cerne R, Cortés RY, Devantier HR, et al. (December 2010). “Triphenylphosphine oxide is a potent and selective inhibitor of the transient receptor potential melastatin-5 ion channel”. ASSAY and Drug Development Technologies. 8 (6): 703–13. doi:10.1089/adt.2010.0334. PMID 21158685. ^ Meseguer V, Alpizar YA, Luis E, Tajada S, Denlinger B, Fajardo O, et al. (20 January 2014). “TRPA1 channels mediate acute neurogenic inflammation and pain produced by bacterial endotoxins”. Nature Communications. 5: 3125. doi:10.1038/ncomms4125. PMC 3905718. PMID 24445575. ^ Soldano A, Alpizar YA, Boonen B, Franco L, López-Requena A, Liu G, Mora N, Yaksi E, Voets T, Vennekens R, Hassan BA, Talavera K (June 2016). “Gustatory-mediated avoidance of bacterial lipopolysaccharides via TRPA1 activation in Drosophila”. eLife. 5. doi:10.7554/eLife.13133. PMC 4907694. PMID 27296646. ^ Boonen B, Alpizar YA, Sanchez A, López-Requena A, Voets T, Talavera K (April 2018). “Differential effects of lipopolysaccharide on mouse sensory TRP channels”. Cell Calcium. 73: 72–81. doi:10.1016/j.ceca.2018.04.004. PMID 29689522. ^ Alpizar YA, Boonen B, Sanchez A, Jung C, López-Requena A, Naert R, et al. (October 2017). “TRPV4 activation triggers protective responses to bacterial lipopolysaccharides in airway epithelial cells”. Nature Communications. 8 (1): 1059. doi:10.1038/s41467-017-01201-3. PMC 5651912. PMID 29057902. ^ Minke B, Wu C, Pak WL (November 1975). “Induction of photoreceptor voltage noise in the dark in Drosophila mutant”. Nature. 258 (5530): 84–7. doi:10.1038/258084a0. PMID 810728. ^ Montell C, Rubin GM (April 1989). “Molecular characterization of the Drosophila trp locus: a putative integral membrane protein required for phototransduction”. Neuron. 2 (4): 1313–23. doi:10.1016/0896-6273(89)90069-X. PMID 2516726. ^ Hardie RC, Minke B (April 1992). “The trp gene is essential for a light-activated Ca2+ channel in Drosophila photoreceptors”. Neuron. 8 (4): 643–51. doi:10.1016/0896-6273(92)90086-S. PMID 1314617. ^ Phillips AM, Bull A, Kelly LE (April 1992). “Identification of a Drosophila gene encoding a calmodulin-binding protein with homology to the trp phototransduction gene”. Neuron. 8 (4): 631–42. doi:10.1016/0896-6273(92)90085-R. PMID 1314616. Clapham DE, DeCaen P, Carvacho I, Chaudhuri D, Doerner JF, Julius D, Kahle KT, McKemy D, Oancea E, Sah R, Stotz SC, Tong D, Wu L, Xu H, Nilius B, Owsianik G. “Transient Receptor Potential channels”. IUPHAR/BPS Guide to Pharmacology.